OkumArts’ David Okum was one of the first artists creating printable miniatures for tabletop RPG gaming including Dungeons and Dragons. His line now includes dozens of PDF miniatures sets covering fantasy, sci-fi, steam punk, modern, post-apocalypse, western and superhero genres. He’s also designed several stand-alone games, including the dungeon-crawler Darkfast Dungeons, and the superhero skirmish game, Save the Day. His work is available at DriveThruRPG or his Patreon. 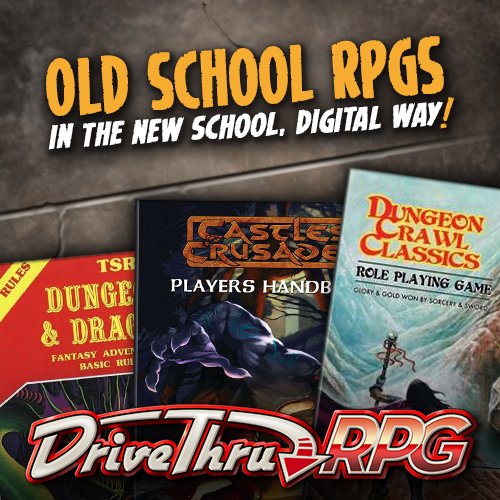 In this post, I’ll share my Top Ten recommended buys during the 2019 GM’s Day Sale at DriveThruRPG. In this post, I’ll tell you about several limited-time offers and sales that PnPG readers may want to jump on before they end. Included are two amazing deals on the fifth edition of the cyberpunk fantasy RPG, Shadowrun, an OSR sale, and a special discount for PnPG readers on my own old-school magic supplement, Cantrips!